To begin the process of calculating the hay inventory needed for the winter, a producer does not need to do math! The first step is simple, send a forage sample in to a certified lab to determine the forage quality. The cost of this analysis is minimal and the lab does the math for you! 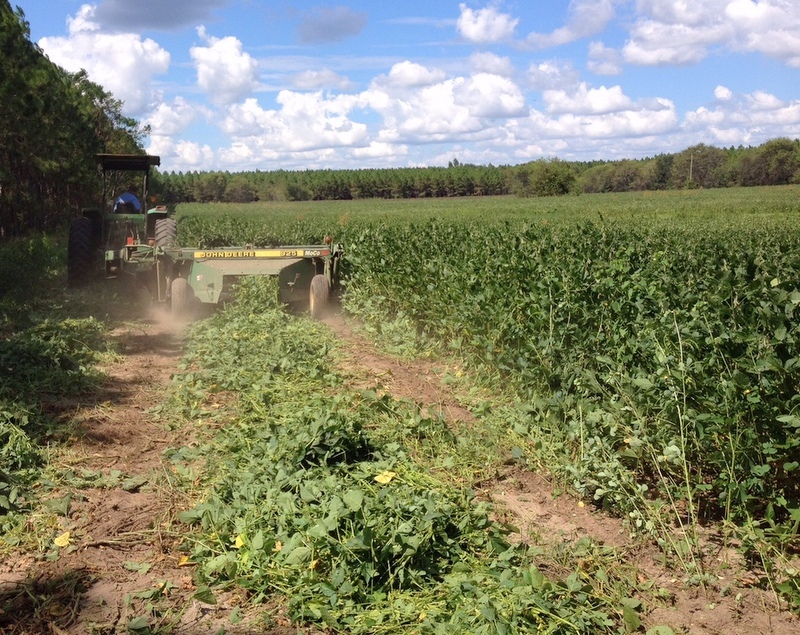 The quality of the forage will determine the amount needed during the winter feeding period. Once the producer receives and understands the forage quality analysis, they then can determine how much hay they will need to supplement. A simple example below shows how a producer can determine their hay needs. A producer has 50 mature brood cows at 1,200 lbs., 2 bulls at 2,000 lbs and 10 weaned replacement heifers at 500 lbs. So, daily hay required would be 1725 lbs. 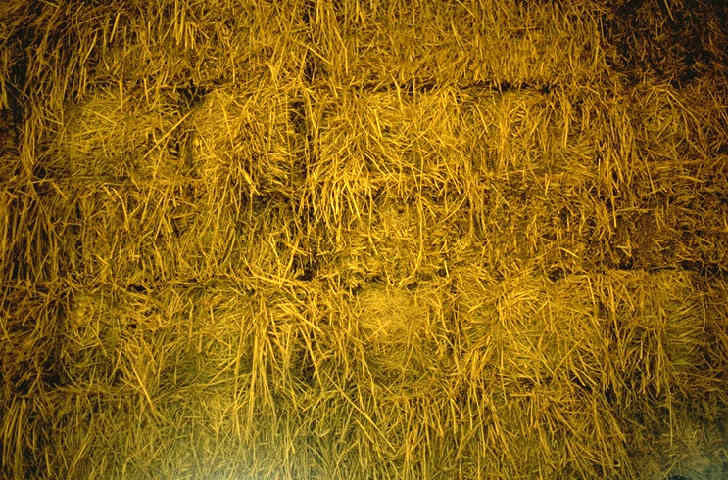 of dry hay (that is at 0% moisture or on a dry matter basis). The calculation of 1725 lbs. 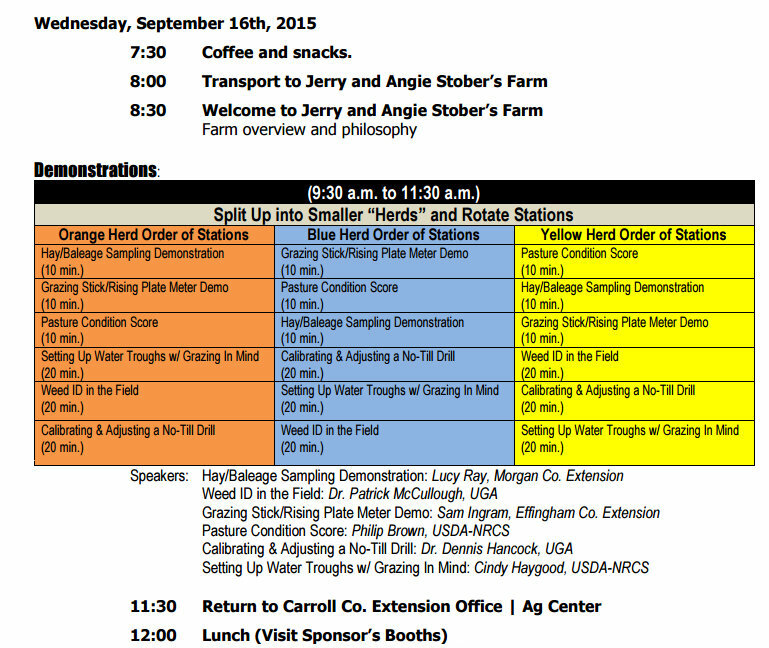 of forage is on a dry matter basis. This means that if we bale the hay or receive hay at 85% Dry Matter (DM), 15 % is water and we do not account for that during feeding. So, a 1,000 lb. bale at 85% DM, would be 850 lbs. on a dry matter basis. To continue on the calculation we need to estimate our feeding period. For this example we will say a producer needs to feed 120 days. So, if we multiply this number by our daily requirement we get an estimation of 120 days X 1725 lbs. = 207,000 lbs. of DM. If we assume the producer has 85% DM hay, then the as fed total would be approximately 244,000 lbs. To account for storage loss and feeding loss (assuming barn stored and fed with a hay ring), we can conservatively add another 15% to the “as fed” total and get a total of 280,600 lbs. In this situation, for this moderate size herd, we need roughly 280 – 1,000 lb. round rolls of hay. Now, depending on where the producer’s brood cows are in their calving season during the winter feeding period will determine if further supplementation is needed. 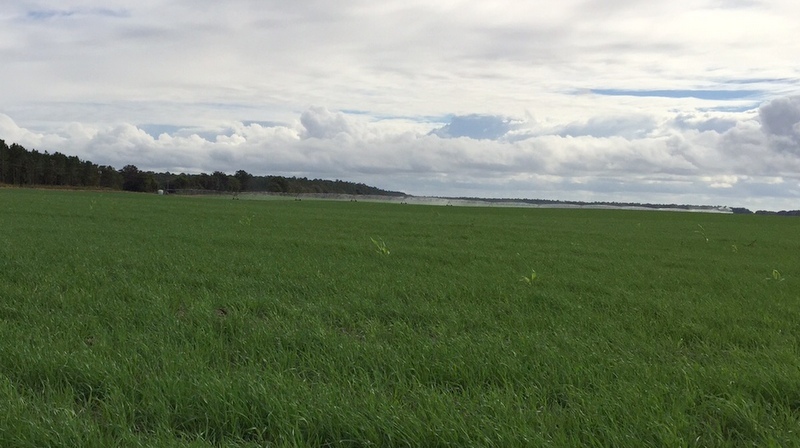 A great option to decrease the need for stored forage or hay is to grow some high quality winter annual grasses. 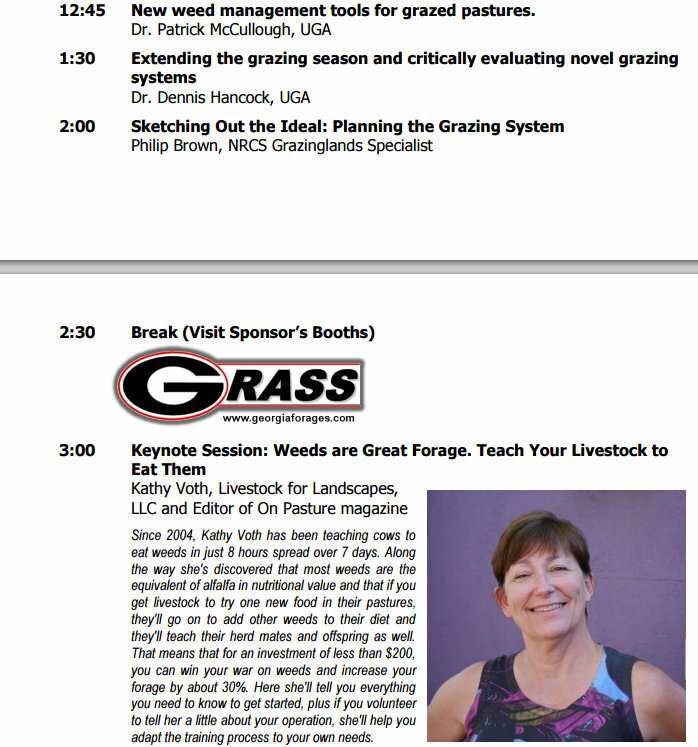 A cow is much more cost-effective at harvesting forages than we are with machinery and these annual grasses can save time producing and feeding hay. In the end a producer needs to be thinking about his or her current hay inventory and start calculating for this coming winter. 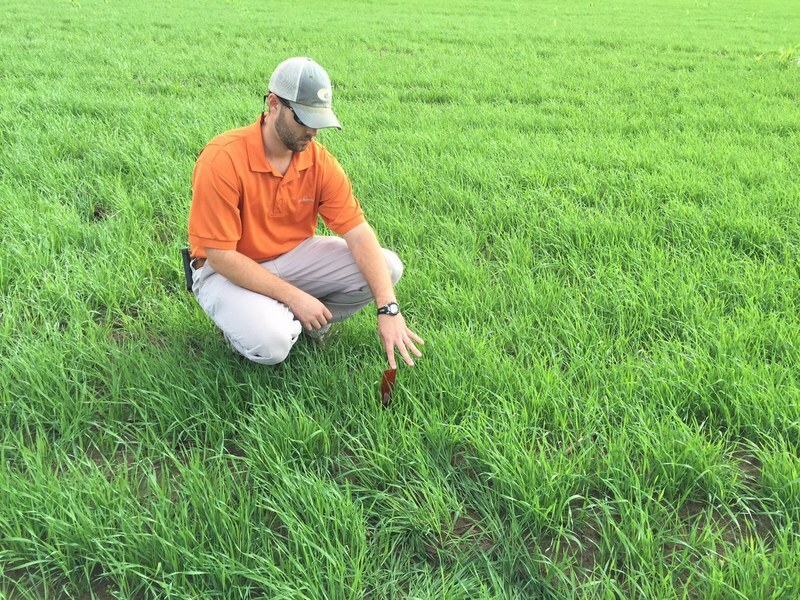 With current grain prices, a concentrate supplement may work out to stretch hay more cost-effectively. Either way, a producer needs to start planning their winter feeding program now, to avoid overpaying for any forage or supplement when supplies get tight. 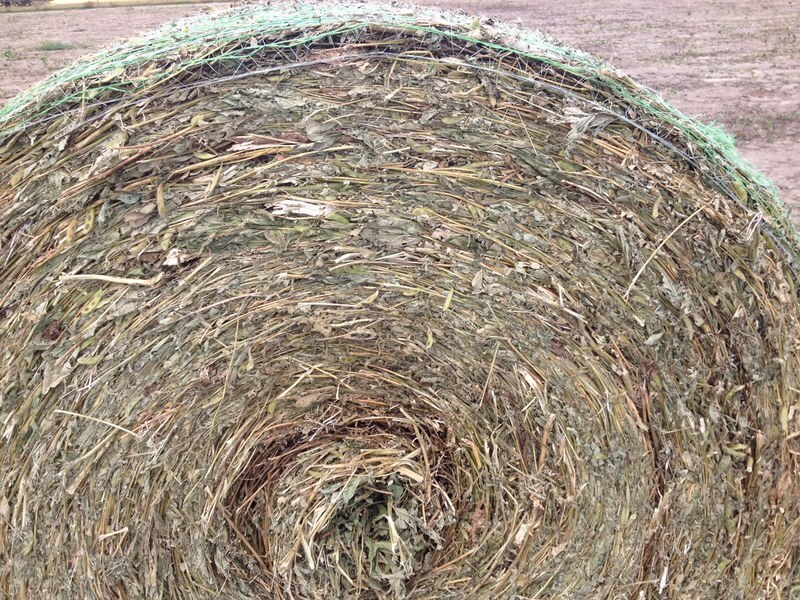 Because of the wet fall, many producers have faced extremely difficult field curing conditions for their hay. Additionally, hay that was bone dry in the field has, in many cases, developed mold problems in the barn. This later issue has been problematic for us in 2015, resulting in a large number of square and round bales covered with black sooty mold. It is arguably more problematic because this is often a barn design issue (e.g., open sides, poor air drainage, lack of ventilation, inability to close off ventilation, etc.). Under the high levels of humidity that we’ve had (because of periods of nearly continuous rain and cool weather) the last 2 months, dry hay will draw moisture from the moist air. For example, hay that is 12-15% moisture (the appropriate moisture for hay storage) may have a 6-12” layer along any exposed surface that may equilibrate at about 30%+ moisture if the surrounding environment is cool (< 70 F) and moist (relative humidity stays > 60%). Any moisture level greater than 20% on the surface could result in significant mold growth/discoloration, and levels greater than 30% moisture can result in the entire stack’s exposed surface being covered in black sooty mold. As a result, our County Extension Agents and I have had an extraordinary number of emails and calls about feeding moldy hay, especially to horses. First, let me clearly state: moldy or dusty hay should NOT be fed to horses. Moldy and dusty hay can lead to respiratory issues in the horse, and can also pose health risks to the men and women who feed the hay to the livestock (e.g., farmer’s lung, etc.). Here’s a link to an excellent Extension article on the subject. Soaking the hay in a water trough before feeding will reduce the “dust” (which is usually mostly mold), but it will also leach out soluble sugars and lower forage quality. This may not reduce the risk of mycotoxins (and yes, hay can have mycotoxins in it just like moldy grain, peanuts, or oilseeds can have in them). For a discussion of mycotoxins, see this article I wrote on the subject. Several companies now sell hay “steamers,” which is a chamber or box wherein hay bales are placed and steam is pumped into the chamber. In addition to the expense, the downside of these steamers is that they will lower the forage nutritive value of the hay and they are unlikely to change the mycotoxin levels appreciably. Ruminant animals aren’t as sensitive to mold problems as horses, but they still can be negatively impacted if care is not taken to prevent health challenges. Feeding slightly to moderately moldy hay (mold spore counts up to 1 million cfu/gram) is relatively safe if feeding cattle or small ruminants, as long as the animals are fed outside or in a very well-ventilated feeding area. Keep in mind that palatability is likely to be a challenge. Hay that emits a substantial cloud of “dust” or continues to emit dust after the disturbance ceases should be assumed to be > 1 million cfu/gram. A test can confirm mold levels. Hay that is obviously moldy (moldy or “mousey” smell or sending off visible “dust” or mold spores when disturbed) should be tested for mycotoxins before being fed. UGA’s Feed and Environmental Water Laboratory (our forage lab) is not equipped to conduct the mold spore count test or the mycotoxin screen. (To my knowledge, Waters Agricultural Labs in Camilla, GA is also not equipped for these tests, but you can contact them to confirm.) You can, however, work through the UGA lab to arrange for these tests to occur. Alternatively, you can submit samples directly to labs that do conduct these tests (e.g, Cumberland Valley Analytical Services, Dairy One). 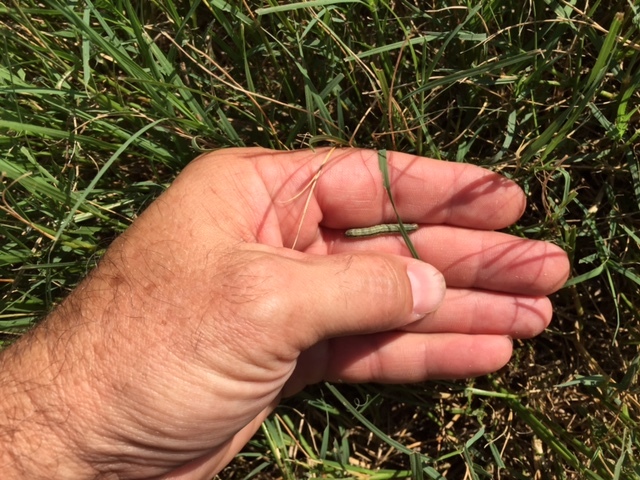 We are finding some caterpillars in grazing this week. I looked at several fields yesterday and about half of them had enough caterpillar feeding to be concerned about. 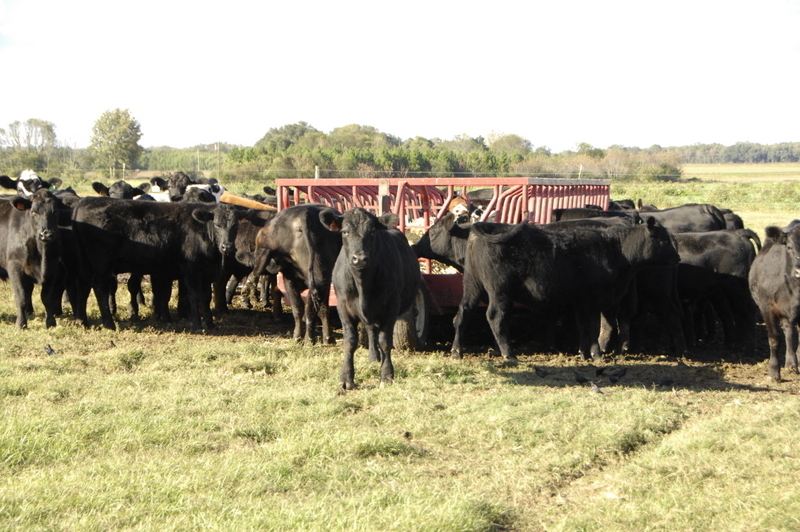 We need all the forage to get to the cattle. The first thing you notice is feeding on the leaves. On the very young forage you have to look close. Often the caterpillar will have done a little feeding maybe just windowpaneing on the leaves. Then look in the leaf whorl, where it’s twisted up and often a tiny fall armyworm will be hiding there. Here below is some young forage with a tiny caterpillar. 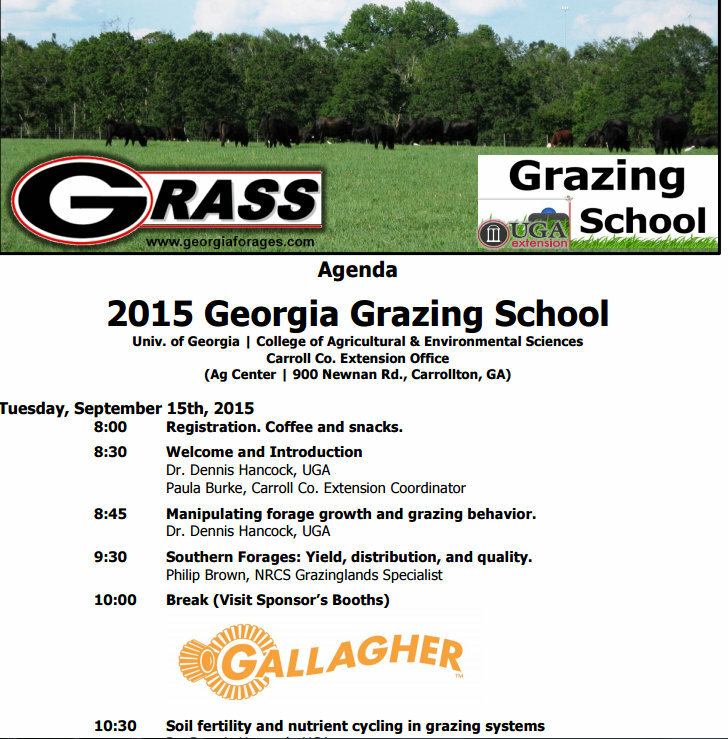 Here is info on the Grazing School coming up . For more info … (Click here to view the agenda register online. First you see a lot of birds feasting on something and having a good time. Then you notice your hay or grazing dissappearing. In this case it was a lot of Fall Armyworms eating this bermudagrass pasture. 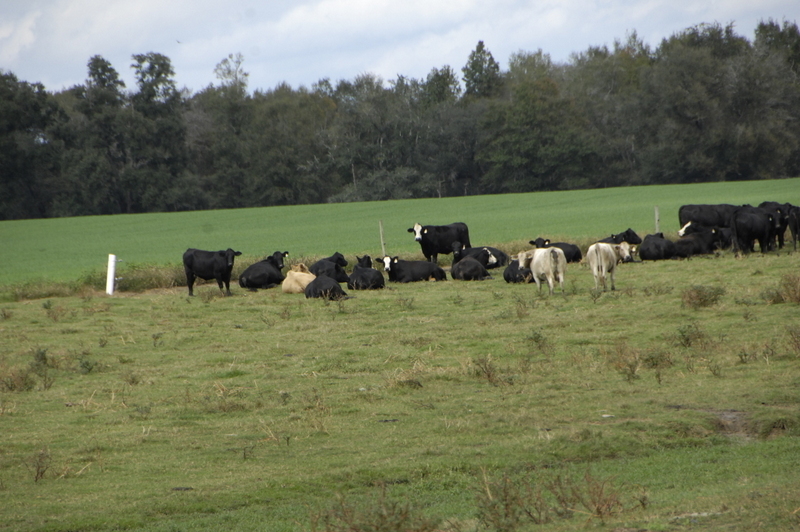 A chemical treatment was made so that the cattle can eat the grass instead of the caterpillars getting it. The birds were enjoying them and were doing good biological control but not quite good enough to save the grass. 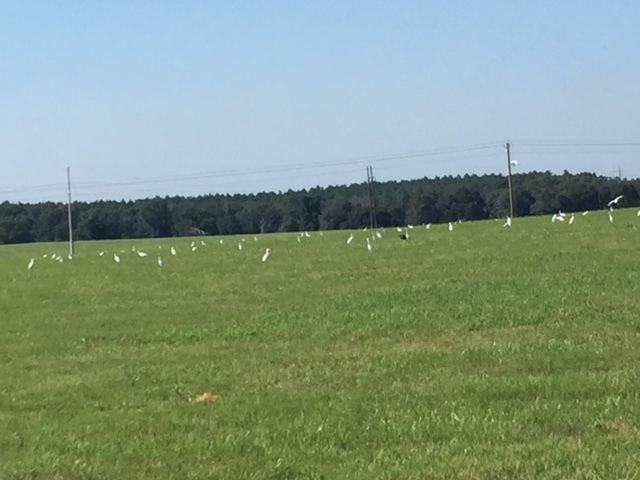 The cattleman said they saw one cattle egret eat 4 caterpillars without moving, so that’s a pretty hefty population. 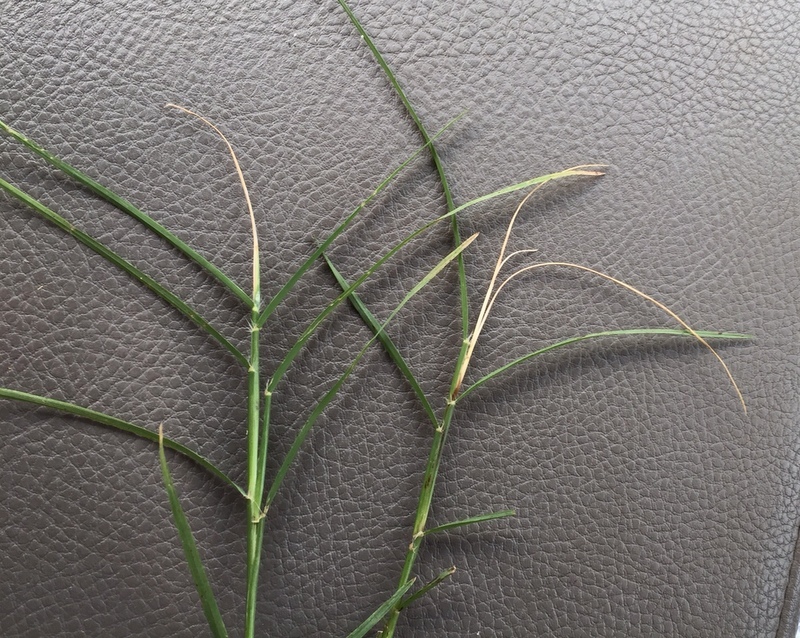 We have been seeing and getting reports of bermudagrass stem maggot damage all across the southern 2/3 of Georgia. Most folks have cut their second cutting and many have started on their third cut. I took the photo below of damage last week. 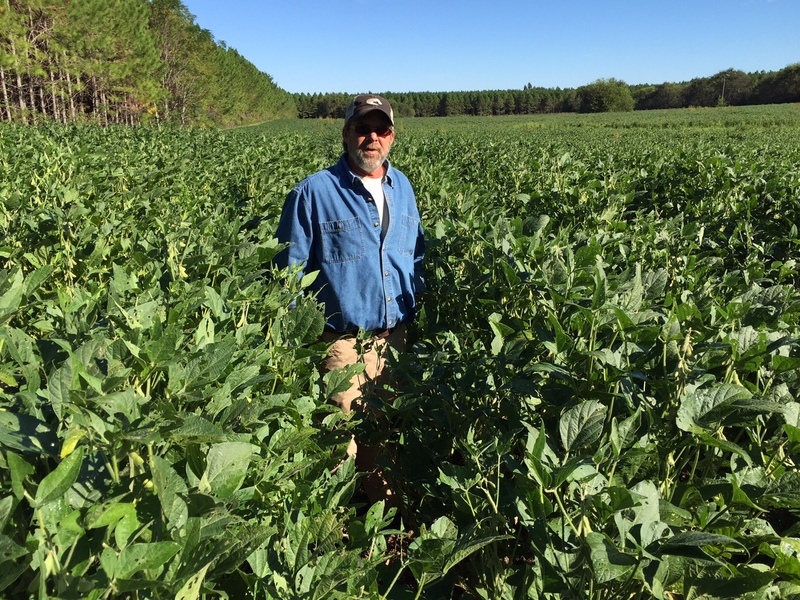 Dr Dennis Hancock, UGA Extension forage scientist, gives this report, “I’ve had a fairly sizeable number of Agents reporting that they have producers who have gotten 3-8 inches of regrowth on their third cut’s regrowth, only to have it stunted by the BSM. This is often enough regrowth (>6 inches) to shade the base of the bermudagrass such that it won’t try to grow through the damage. As such, this is the worst case scenario, and the only thing for it is to clip the bermudagrass back and use an insecticide to suppress the BSM population long enough for the bermudagrass to grow up. Following the recommendations found here (http://bit.ly/BSM2015), many producers have successfully used a pyrethroid to suppress the BSM fly populations. But, timing is CRITICAL! Producers spraying 7-10 days after the previous crop was mowed have found that this one application will protect the crop at least until it is 3-4 weeks old. Meaning: the second spray is not likely to be needed. 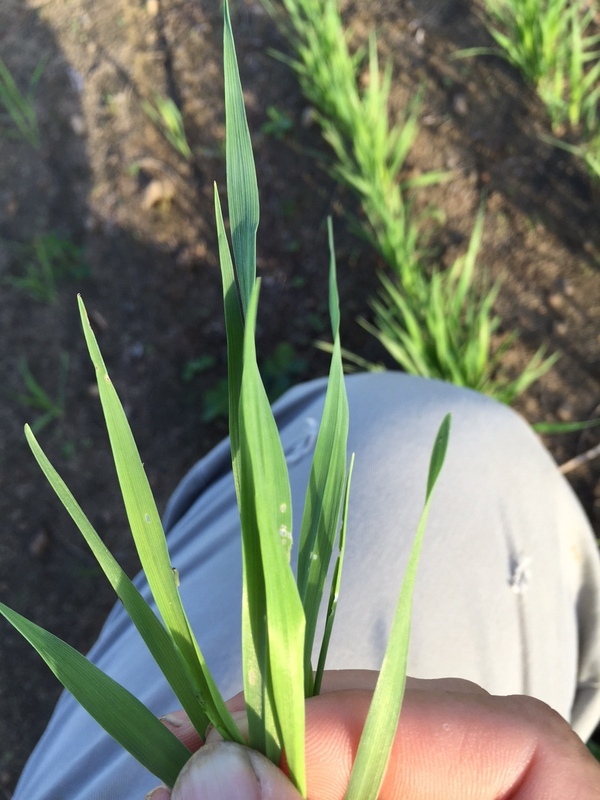 By the time it gets 3-4 weeks old, the damage done to the top 2-3 leaves at that point would not be enough to justify the cost of the spray and the damage done by the spray rig driving across the field. 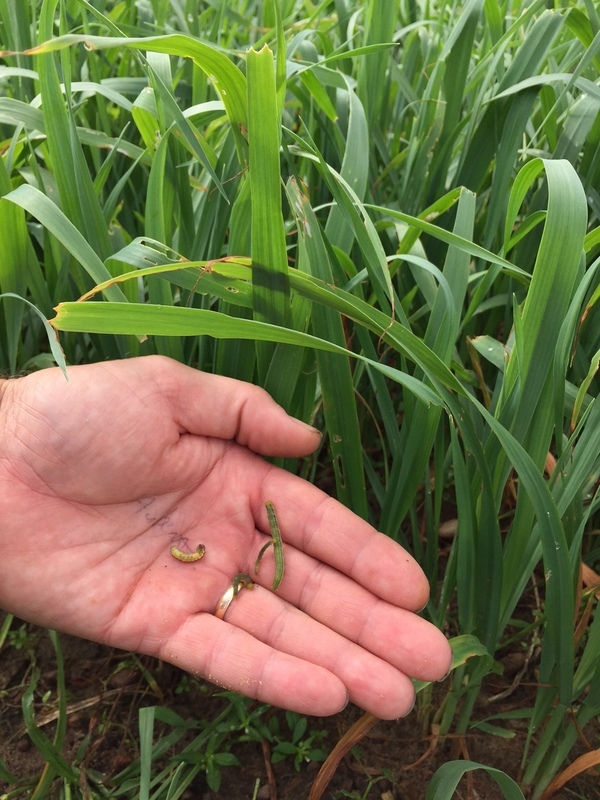 If it is 3-4 weeks old and starting to show signs of damage, it would be better to harvest the crop and protect the regrowth. 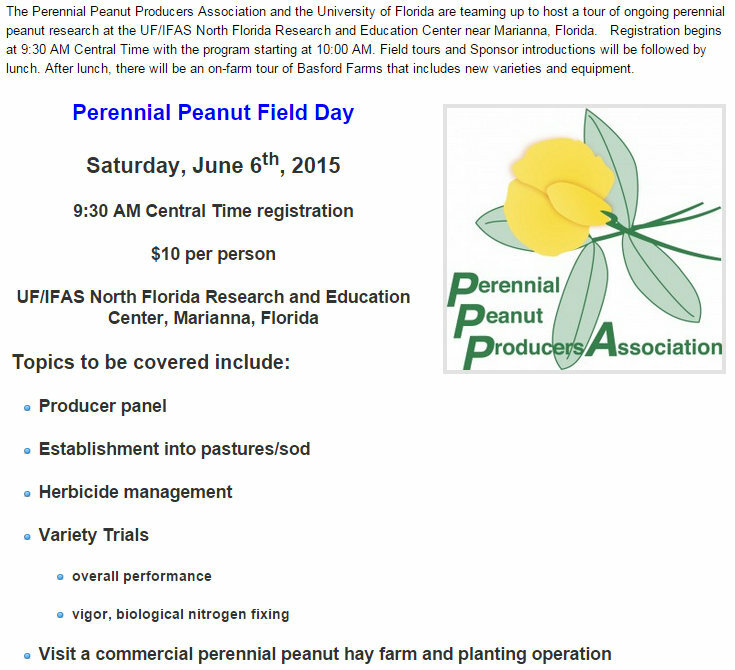 There is a good Perennial Peanut Field day coming up in Marianna, Florida. For the details go to the Panhandle Ag News. I’ve had a couple of growers lately say that hay is a profitable part of their farm and they would like to grow more of it per acre. 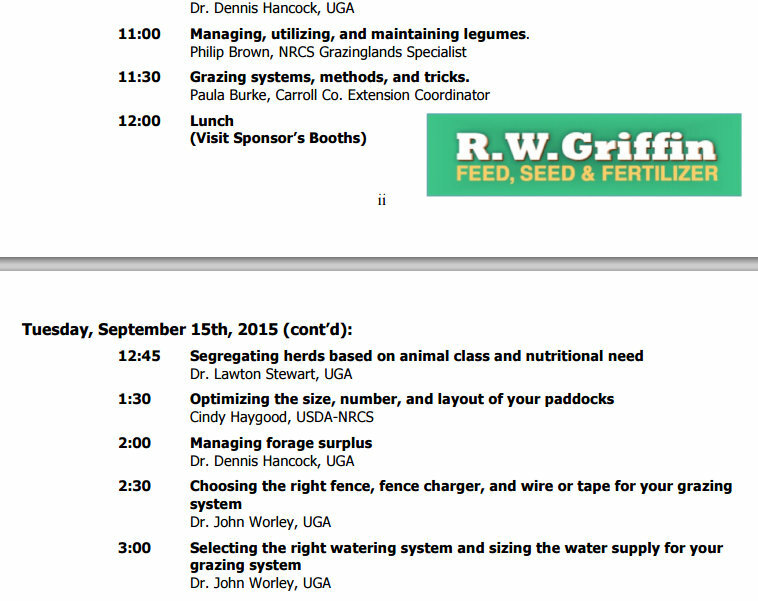 Here’s a great meeting to go to to get some good hay and forage growing information. 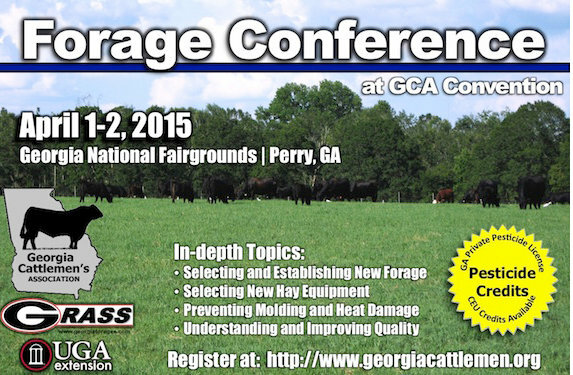 Go to Georgia Forages.com and click on upcoming events. It’s on April fool’s day but it’s no joke.